The 2nd Race I had the privilege of attending in 2015 was at Spa Francorchamps in Belgium. Spa is a fair distance away from Brussels, the capital of Belgium but closer to the German Town of Aachen & Dutch Town of Maastricht. I had to make a choice and chose Maastricht as my resting place for the First 4 days of my trip. I flew out of Mumbai on 20th August 2015 bound for Brussels. Maastricht was an hour away from the airport. The return pickup was form the heart of Brussels and on 28th August 2015. A brisk check-in, not so brisk Security and Immigration check and it was time to relax in the lounge. The Boarding commenced and I received a big surprise. I had been upgraded to First Class due to the Flight being overbooked. I had Bollywood Celebrity Akshay Kumar and I wasn't complaining. Well, who doesn't enjoy an upgrade! My First Class Suite! The Best Piece of News I received on boarding the flight. Ferrari had retained Raikkonen for 2016! YES! Spoilt for choice when it comes to food! Up in the air, Brussels beckons! Mercedes E Class for pickup at Brussels, nicely done! Enroute to Maastricht, Netherlands. Emirates chauffeur drive are allowed to cross borders. The return flight was also a ﻿777-300ER ﻿and a red-eye flight. Touching down at Mumbai Airport on a very rainy morning! It was the first time that I had to travel in the afternoon on a return flight since ﻿Emirates ﻿only operates one flight to ﻿Brussels. ﻿I landed at 9 in the morning which was pretty bizarre and personally I would still prefer a night flight for my return. Nevertheless the service onboard was impeccable. Only one post remains in the ﻿Flying Diaries ﻿series ( ﻿Mumbai - London ﻿) but rapid updates coming your way. The latest being the ﻿F1 Season preview. I had made a short trip to Dubai at the start of 2015. Plans were already in place for the races to attend in 2015. Austria would be the First Destination. The Track was situated in Spielberg, a considerable distance from Vienna but closer to a city called Graz. Graz was an hour's drive from Vienna and plans were drawn to fly into Vienna for the race. The Outbound Flight was on 18th June 2015 and the inbound on 25th June 2015.
Business Class lounge at Mumbai Terminal 2. A Brisk Security check during transit and I was standing in the Business Class Lounge. I have lost count of the total number of lounges at Dubai! Loads of departures in the morning. A good rest in the lounge and it was time to board the flight to Vienna. This was a Boeing 777-300ER. Planes, planes and more planes, all around! Codeshare Qantas A380 in the mix as well. A Mercedes E Class to drive me down to Graz, more than an hour away. The return pickup was from Le Meridien Vienna. I had a Mercedes Minivan for pickup. Emirates replicate the night sky in their cabins. Nice touch! I got some more time to spend in the Business Class Lounge on my return journey and I was awed by the Service Offered. 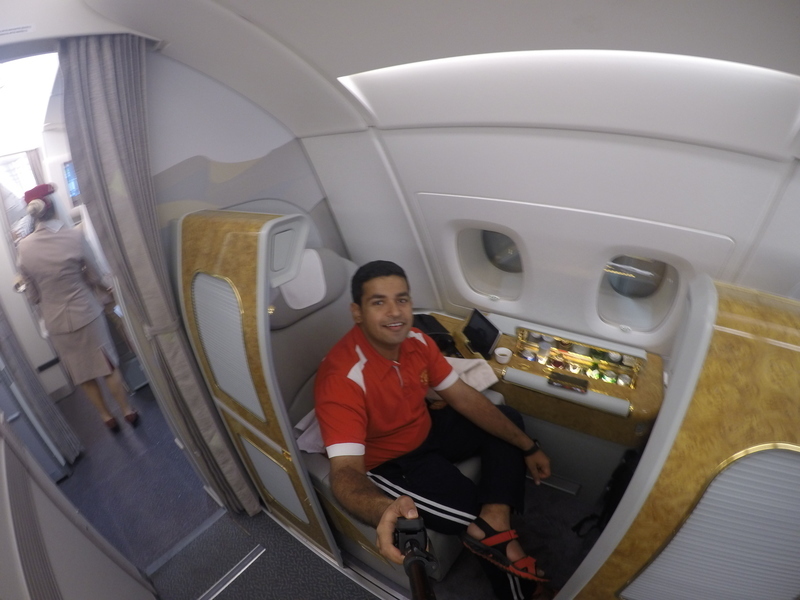 I really enjoyed the trip to ﻿Austria ﻿and ﻿Emirates ﻿ensured that the journey was as good as the destination. There is nothing that is found wanting in ﻿Emirates' ﻿Hospitality. I continue to be a patron. 2015 F1 Season Review - The Three Pointed Star! 2015 was the 2nd year in the new era of F1. 2015 saw teams ironing out issues from the previous year and even forming new partnerships. 2014 Champions Mercedes AMG Petronas had high hopes for 2015, Ferrari were determined to take the fight to the Mercs while Red Bull were hoping to have a faster and a more reliable engine with Renault. Lotus F1 saw it wise to switch to Mercedes power for 2015, Toro Rosso to Renault while Sauber & the new entrant Manor F1 ( formerly Marussia ) stuck to Ferrari Power. McLaren welcomed the return of Honda to F1 and became the works team. Experts said the First year for Honda would be tough but McLaren had hopes of rolling back the years to Senna - Prost era. Hamilton who became a Double World Champion in 2014 hoped to replicate his form in 2015 while Rosberg promised to leave no stone unturned in his challenge. Sebastian Vettel said goodbye to Red Bull and switched to Ferrari to partner the Iceman and his close friend Kimi Raikkonen. Alonso moved onto a new challenge and rejoined McLaren to partner Button while Kvyat graduated to the Senior Red Bull Team and the Junior sported very young and inexperienced drivers. The removal of double points for the final race was a welcome change. Enough of the teasers, time to assess the performances of teams and drivers alike in 2015. Mercedes flattened the opposition in 2014. The Constructors' Championship was like a "Walk in the Park". Lewis Hamilton prevailed against his team-mate in the final race to win the 2014 Drivers' Title. 2015 promised to be no different. The 2nd year of the V6 era would see the Works Team produce a faster and more refined version of its predecessor. Constructors' Championship was an easy feat to achieve. Barring a blip in Singapore alongwith a couple of retirements, the W06 was a highly reliable car. Lewis Hamilton sealed his 3rd Drivers' Title in United States while Nico Rosberg finished strongly in the 2nd half of the season. Lets take a quick look at the driver performances. Lewis Hamilton had the measure of Rosberg right from the start. Once he won the Championship, it looked like he let his foot off the gas. Hamilton was on it right from the start of the season, notching up 5 wins, three 2nd places and one 3rd place in the first half of the season. Post the Mid-season break, Hamilton won 5 out of 6 races, Singapore a retirement for the Brit. Hamilton sealed the deal in United States matching the number of titles of his childhood hero and legend Ayrton Senna! Hamilton did lose some momentum finishing 2nd best to his team-mate in the last 3 races but he had performed when it mattered. He proved his mettle on the Sunday, more often than his team-mate making the most of the opportunities for the 2nd consecutive year. Hamilton scored 381 points. Nico Rosberg hoped to take the battle to Hamilton and won 3 races in the first half of the season, besides 5 podium finishes. He didn't have an answer after the break unfortunately being beaten fair and square by his team-mate. 2 retirements, engine failure in Italy & throttle failure in Russia almost ended his title hopes. An uncharacteristic error in USA meant curtains. Rosberg found a gear in the final 3 races and turned the tables winning them all, too little too late though. The results should galvanize him for 2016, boost confidence and make him believe that his team-mate can be beaten. Rosberg worked hard but Hamilton just had that edge. Rosberg had a tough battle with Vettel for 2nd place in the Championship but sealed his place with his victories in the end. Rosberg scored 322 points. Mercedes had the quickest car on the grid but Ferrari gave them a reality check in 2015. Mercedes had to dig deep to maintain their advantage and smashed the record for the points scored in a Constructors' Championship with a mammoth tally of 703 points! Mercedes remain favourites for 2016 but I do see them nervously looking over their shoulder hoping to keep the Scarlet Red cars at bay. Ferrari had a shocker in 2014. They had got everything wrong in the inaugural year of the V6s and a change of guard at the helm was brought about with the hope of restoring some order. Fernando Alonso chose a move to McLaren seeking a new challenge, which he might regret now. Raikkonen was joined by friend and neighbour, not to mention a 4 time World Champion Sebastian Vettel. Hopes were high and Ferrari had a quiet confidence about themselves going into 2015. 2 race victories ( minimum ) was the target set. Ferrari clearly was the team that took the fight to Mercedes AMG F1 and were the "best of the rest" on the grid. Vettel won the team-mate battle comfortably. Sebastian Vettel was in the title hunt for quite sometime until the engine penalty ( planned ) in USA ended his title hopes. Vettel was involved in a see-saw battle with Rosberg for 2nd place until the German got his act together to win the last 3 races and squash the challenge. Vettel gained the love and support of the team and the Tifosi fairly quickly with his stunning performances. Mistakes were sparse and Vettel had the joy of being on the top step of the podium in 3 races - Malaysia, Hungary and Singapore. Vettel suffered 2 retirements, one due to a dangerous tyre blowout denying him a 3rd place in Belgium and a crash in Mexico which followed a series of errors. Vettel had 10 podium finishes besides the 3 victories to finish 3rd in the Championship with 278 points. Kimi Raikkonen, the Iceman had a better 2015 but not an ideal one in his own words. Raikkonen finished 4th after winning a hotly contested tie with Bottas, 138 points behind his team-mate. The points disparity was huge but the Flying Finn had his wings cut more often than not in races - A loose wheel in Australia, puncture in Malaysia, accident in Austria, Wrong tyre call in Britain, MGU-K Failure in Hungary, Gear-box Failure in Belgium GP Qualifying. Raikkonen had committed mistakes too, the one in Russia on Bottas and the spin in Montreal handing the same man a podium. The Worst misfortune was when his car stalled on the grid at the start of the Italian Grand Prix. Raikkonen had qualified 2nd in front of the Tifosi and hopes were high for a Ferrari victory. Many wanted the Finn sacked but Raikkonen showed his class and ability by finishing 2nd ( season best ) in Bahrain and notching up two 3rd place finishes in Singapore and Abu Dhabi. Raikkonen eventually prevailed in his battle with Bottas to finish 4th in the Championship with 150 points. James Allison, Ferrari's Technical Director praised Raikkonen and defended Ferrari's decision to retain him rightly pointing out that Raikkonen was faster than Vettel on many occasions, qualifying being the only gremlin that needed to be addressed. Raikkonen also had reliability issues that denied him better race results. 2016 should be a better year for the Finn. Ferrari had a satisfactory 2015 but knowing Ferrari, the goals for 2016 will be much higher. The duo of Vettel and Raikkonen changed the atmosphere within the team. Retaining Raikkonen was the right decision and will maintain stability besides strengthening the challenge for 2016. As a Raikkonen Fan I dare to believe that he will be a close contender for the crown in 2016. Remember he belongs to the select few who won a Drivers' Championship in their debut year! Williams was the quickest customer team of Mercedes in 2014. The duo of Valtteri Bottas and Felipe Massa humbled the mighty Ferrari, a victory of sorts especially for Massa. Williams had their work cut out for 2015 and the benchmark was raised. Massa and Bottas would bear the load of carrying the team through in 2015. Williams however weren't able to replicate the form of 2014. Williams was always playing catchup with the Mercedes Works team and Ferrari. They were able to capitalize on the mistakes of their rivals in a few races but other than that they were the 3rd best team on the grid. Silverstone was their best chance at a double podium and possibly a victory. Tactical errors robbed them. Lets take a quick peek at how their drivers fared. Bottas won the team-mate battle and the gap of 15 points is deceiving. The Finn wasn't able to start in Australia due to a mechanical failure but scored a chunk of points consistently from thereon. Two 3rd Place finishes in Canada and Mexico helped him keep pressure on Raikkonen for 4th place in the Championship. Bottas and Raikkonen came together in Russia and both were robbed of a potential 3rd place. Kimi was blamed for the incident and penalized. The duo came together again in Mexico with Kimi being the aggrieved party but Bottas escaping penalty. Bottas suffered just one other retirement in USA. A dismal final race in Abu Dhabi denied Bottas a shot for 4th place. Bottas scored 136 points to finish 5th in the Championship. Massa had a roller coaster season in 2015. From the highs of finishing 3rd in Austria ( Thanks to Vettel's slow pit stop ) & Italy ( Thanks to Raikkonen stalling on the grid ) to the lows of 2 retirements in Singapore and USA and disqualification at his home race in Brazil due to discrepancies in tyre pressures, Massa has experienced it all. Massa had a good 2015 nonetheless and would hope for a better year in 2016. He scored a total of 121 points and finished 6th in the Championship. 2015 was somewhat of a step back for Williams and the team would be hoping to be a lot closer to their competitors in 2016. They have the funds and the people to accomplish this. 2016 will be interesting for them. Red Bull Racing, works team for Renault had a topsy-turvy 2014. The Team hoped for a change of fortunes in 2015 but it was worse than 2014. The Relationship that saw the team bring 4 Consecutive World Championships ( Drivers and Constructors ) was fractured and eventually destroyed over the course of 2015. Red Bull were not happy with the Renault power units which besides misfiring were extremely unreliable. Claims of improvement post upgrades produced next to nil results. The tie was severed for 2016 and 2015 just became a season that had to be "finished" for the team. The latter stages of the season featured being peppered by the media about the engine deals the Milton Keyes based outfit were exploring. Mercedes deal fell through, Ferrari refused 2016 spec engines from the fear of competition, Honda had no intentions and the threat of a withdrawal loomed for the team. It was sad to see the focus shifting from the performances of 2015. I must not repeat the mistake. So, returning to 2015, Daniil Kvyat joined forces with Daniel Ricciardo, the Russian replacing the highly decorated and loved Sebastian Vettel who jumped ship to switch to the red overalls of Ferrari. Ricciardo had beaten the outgoing Vettel in 2014 and it was interesting to see how he would cope with his quick and young team-mate. Ricciardo lost the battle this time, albeit a very closely contested one. Red Bull finished 4th in the Constructors' Championship with 187 points. Kvyat finished 7th in the Drivers' Championship narrowly beating his team-mate Ricciardo. The Russian was at home in his car and didn't let the disappointment ( Did Not Start ) of his debut hamper his performances. Scoring consistently, his efforts were rewarded with a 2nd place finish in Hungary. Kvyat finished with 95 points. Ricciardo didn't lag behind in his performances and matched Kvyat in many races. He scored 2 podium finishes too ( 2nd in Singapore & 3rd in Hungary ) but 4 finishes outside the top 10 hurt him bad. 92 points and 8th place in the Championship for the Honey Badger. Ricciardo has his work cut out for 2016 now and I would like to see him get the upper hand this time. "Oh how the mighty have fallen" summarizes the state of Red Bull Racing. The ruptured relationship with Renault almost left them without an engine supplier until an understanding was reached when they confirmed a deal to run TAG Heuer branded Renault engines in 2016. The travails of Red Bull don't end here though. The loss of revenue, their say in the future structure of the sport leaves their future in balance. All this could change if the team returns to the pedestal which would be really good for the sport! Sergio Perez won the team-mate battle in 2015. Perez had almost a trouble-free 2015 with just one retirement. His 3rd Place Finish in Russia saw Force India return to the podium for the first time since the 2009 Belgian Grand Prix. Perez finished in the points in 11 other races. Perez finished 9th with 78 points. Nico Hulkenberg didn't have smooth sailing in 2015. 4 retirements and a "Did Not Start" in Belgium ( Engine Failure ) hurt his chances of a 9th place finish badly. Hulkenberg was a tough nut to crack and produced great results when he had a proper functioning car under him. Him best finish was 6th, thrice in the season - Austria, Japan & Brazil. Hulkenberg completed the top 10 with 58 points. Force India, just like Lotus F1 show a lot of promise. Progress is slow and the battles get tougher higher up the grid. Force India dare to dream and I do see them challenge that elusive 4th place in the Constructors and the benefits that come with it. How much will they have in the wallet for 2016 remains the big question. Lotus F1 had a dismal 2014. 2015 saw them switch engine suppliers from Renault to Mercedes. Romain Grosjean & Pastor Maldonado continued their partnership & the team hopes to have a better outing. The Lack of finances meant that the frequency of upgrades was low and progress slow. The team also suffered from delayed arrival of freights on race weekends, not to mention being locked out of their Hospitality units due to non-payment of dues. This occurred more often than not in the second half of the season. However these off track issues didn't deter the team from producing stunning results come Sunday. The team displayed amazing grit and will power to keep fighting and finished a commendable 6th in the Constructors' Championship. How did the drivers fare? Romain Grosjean, unsurprisingly was the more successful of the duo. Grosjean was on the edge of point scoring positions in many races but Belgium saw him score a fairy-tale 3rd, rewinding back the time to 2012 and 2013. Grosjean scored a total of 51 points and finished 11th in the Championship. His performances proved to be pivotal in the battle with the Toro Rossos. Maldonado on other hand attracted the ire of Fans and Media alike with his reckless moves on co-drivers. 5 out of the first 6 races were retirements. The 2nd Half of the season yielded better results but the final tally still don't justify his place in the pinnacle of motorsport. 7th was the best Maldonado could conjure, albeit 3 times this year - Canada, Austria, Russia. He finished 14th in the Championship tied on 27 points with Nasr, the latter's better finishing position at Australia giving him the upper hand. Lotus F1 is a team I shall always love and support. It was nice to see them recover from the shock of 2014. There isn't a team like them and I am so happy to know that Renault have taken over the reigns for 2016. This will not only address financial issues but also provide the bright minds at Enstone the much needed money to build a more than capable challenger. The Driver Lineup sees a change as well with Palmer partnering the misfiring Maldonado. Prospects will be explored in the 2016 Preview. Toro Rosso were at the centre of media attention throughout the season. The Team hired the services of two youngsters one a minor. Both had Fathers who raced in F1 and maybe that fast-tracked their entry into F1. Carlos Sainz Jr. made a name for himself in the lower categories and was soon justifying the backing of the Red Bull Driver program. Max Verstappen landed the 2nd seat after being the test driver in 2014. The Dutch Youngster completed only 47 races, Formula 3 being the only series he had raced in before F1. Experts and media alike were skeptical of this new pairing. Questions were raised about the inexperience of both drivers since Red Bull had drivers racing in GP2 the feeder series. However the performances of both the drivers would leave everyone impressed. Max Verstappen quickly developed a reputation of a fearless but not reckless rookie. He was fast all season, seriously fast! The youngster learned quickly and pulled off some sensational moves. He refused to abide by team orders on a few occasions too but these decisions helped him stay ahead of his team-mate and score 49 points with 4th being his best finish twice in the season ( Hungary & USA ). Max is young but has been on a rapid learning curve and 2016 will see him go from strength to strength. Respect to the Dutch Stallion for proving doubters ( including me ) wrong!